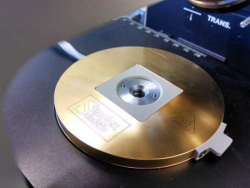 The VariGATR™ grazing angle ATR accessory is a revolutionary approach to the analysis of monolayers on semiconductor and metallic substrates. The VariGATR™ is variable angle, so the incident angle can be optimized for the highest sensitivity with these types of samples. 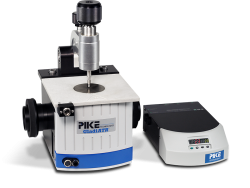 Its specially designed pressure applicator is optimized for delivering good contact between the sample and the Ge ATR crystal. The VariGATR™ is excellent for rapid, repeatable measurements and provides at least an order of magnitude increase in sensitivity relative to grazing angle methods. In addition, it offers the convenience of an easy to use, fully prealigned, horizontal sampling accessory. Built-in pressure applicator with slip-clutch for reproducible pressure application. Continuously variable angle from 60º to 65º allowing optimization for maximum sensitivity. Anti-backlash mechanism allows for accurate, reproducible angle selection. 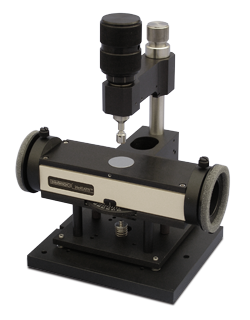 Accommodates samples up to 8″ in diameter with center-sampling of discs up to 6″ in diameter. Wire Grid Polarizer for enhanced spectral contrast and orientation studies. Includes slide plate mount. 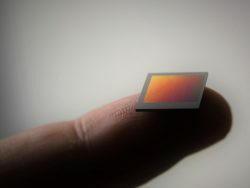 Force sensor with digital read-out for precise measurement of the force applied to achieve contact between the ATR crystal and the sample. Angular scale viewing aide for large samples. 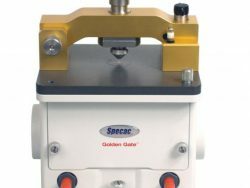 Built-in pressure applicator, designed to accommodate large samples. Mounting hardware for the specified spectrometer.